One of the pleasures of the new Get Smart movie is composer Trevor Rabin's fresh take on the TV series' original theme by Irving Szathmary. Unfortunately, despite the fact that his music is used throughout the score, Szathmary's name appears nowhere in the film's credits. Only on the Varèse Sarabande soundtrack CD is the composer properly acknowledged. The creator of one of the 1960s most familiar TV themes is a virtually unknown musician who seemed to appear out of nowhere, scored one of the most popular sitcoms of its time and then disappeared from show business. Nobody who watched television 40 years ago could forget that tune. Written in 12/8 time and underlined by that seemingly unstoppable electric-guitar ostinato, Szathmary's music – part sitcom-funny, part espionage-serious – accompanied Don Adams and his Sunbeam Tiger screeching around a Washington, D.C. street corner every week for five years. And his underscore punctuated the action for all 138 episodes. Born Isadore Szathmary, in Quincy, Mass., on October 30, 1907, he was the eldest of six children of a Hungarian-born father and Rhode Island-born mother. 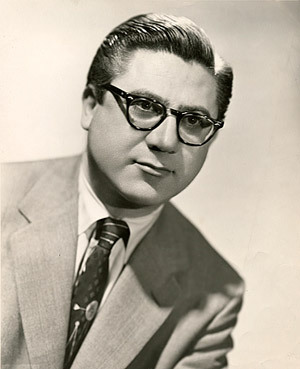 His youngest brother would eventually become the most famous: Comedian Bill Dana, whose José Jimenez character catapulted him to fame in the 1960s. By the time Isadore graduated from Quincy High School in 1925, he had taken the name Irving. By 1936, he was also leading his own ensemble in a weekly radio show on WJZ, flagship station of the NBC Blue Network, called Symphonique Moderne. During the war years, Szathmary arranged and conducted dozens of pieces for transcription discs that were specifically designed for radio play or for overseas listening by servicemen. For Lang-Worth Transcriptions, Associated Transcriptions and U.S. Treasury Transcriptions, he wrote arrangements of nursery rhymes, old folk tunes and classical pieces. The Lang-Worth transcription discs provided radio stations with unique programming, and "Szath-Myri" – as he billed himself for many broadcasts of the 1940s – conducted them for programs called Symphonic Swing, The Silver Strings and The Cavalcade of Music. He also served as musical director for the Michigan Radio Network's The Goebel Hour, a Goebel Beer-sponsored show that featured popular music "direct from RCA Victor Studios in New York City." His sole hit as a songwriter was "Leave It to Love" (with lyrics by Lee Berke), recorded in 1948-50 by Dinah Shore, Perry Como, Hugo Winterhalter, Ray Anthony, Ted Heath and, in the 1960s, Peggy Lee. Szathmary's earliest known effort in dramatic scoring was for a prestigious 1950 United Nations radio drama, Shooting Gallery, about the horrors of drug addiction and the UN's efforts to stop international drug trafficking (narrated by Gary Cooper). Brother Bill arrived in New York in the early 1950s, performing standup under his birth name Szathmary, which apparently upset his older brother. "Don't you know that I have a reputation in music?" Irving asked Bill, who soon changed his last name to Dana, a variation on their mother's first name Dena. Bill went on to huge success as a writer for The Steve Allen Show, where he created José Jimenez, and befriended and wrote for fellow comedian Don Adams. Irving Szathmary remained in New York throughout the 1950s, creating arrangements for the Lucky Strike Hit Parade, The Ed Sullivan Show, industrial films, and TV and radio spots for advertising agency BBDO. According to his list of credits, he was engaged by several leading vocalists including Frank Sinatra, Mary Martin, Georgia Gibbs, Diahann Carroll, the Modernaires and opera stars Lauritz Melchior, Eleanor Steber and Robert Weede. Szathmary brothers Al, Bill (Dana) and Irving, circa 1960s. 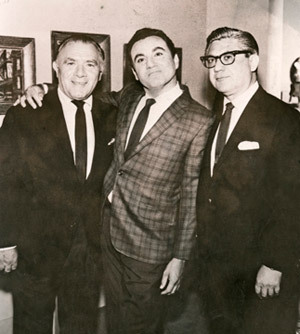 Dana brought brother Irving out to Hollywood, probably in late 1961 or early 1962, where he introduced Irving to his friend and fellow writer, Leonard Stern. "Throughout the years we worked together, Bill kept talking about his brother, who was a composer and orchestrator," Stern recently recalled. When, in 1962, Stern created the comedy I'm Dickens, He's Fenster about two zany carpenters (played by John Astin and Marty Ingels), Dana suggested Irving as the composer. Stern agreed to meet him. Stern recalls telling Szathmary, "I'm the least qualified to judge music. I think I'm possibly tone-deaf. But I do know what I like, and if you can possibly create that sound, I want it to be distinctive – for people, when they hear the music, to know the show is on even if they're not in the room." Stern loved the silly sound of the old Laurel & Hardy theme and suggested something like it. Szathmary returned a day or two later with a theme. "I sensed there was something unique about it," says Stern, but Szathmary decided to prepare a more elaborate demonstration. Another day or two later, he returned with a bass player, drummer, saxophonist and even a vocalist (Irving played piano). "Finally I started to hear the distinctive melody," says Stern. "So I hired him, and he made the arrangements and conducted the orchestra as well." Szathmary's "Dickens and Fenster March," with its comically off-key orchestration, was unique in early '60s TV, and was even recorded by Nelson Riddle. I'm Dickens, He's Fenster lasted only a single season. In the meantime, NBC greenlit The Bill Dana Show for the fall of 1963, with Dana playing his beloved José Jimenez character. As a production of Danny Thomas and Sheldon Leonard, house composer Earle Hagen was already committed to write the theme ("José Olé," a fun Mariachi tune) but Hagen turned week-to-week scoring duties over to Szathmary, who scored the entire season and a half of The Bill Dana Show. 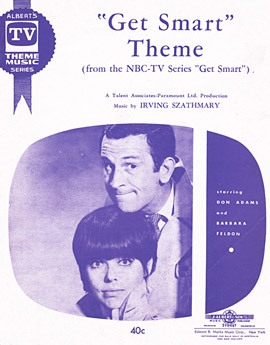 And just as The Bill Dana Show was being cancelled in early 1965, Stern had Get Smart going into production – with Dana's friend and longtime writing partner Don Adams – and offered the music assignment to Szathmary. Szathmary consistently used a 16-piece band on the show. Regulars included several jazz notables Pete Jolly on piano, Ted Nash on saxophone, Abe Most on flute and Chuck Berghofer on bass. Joey Green, author of The Get Smart Handbook, finds the theme not only catchy but right in keeping with the show's concept. "Maxwell Smart is obviously an imbecile but doesn't know it," he says. "The theme song is very serious, very much along the lines of a James Bond or Mission: Impossible thing. It takes itself seriously and doesn't reveal that it's a joke." During the heyday of spy TV in the '60s, Szathmary's Get Smart theme was covered by more than half a dozen recording artists, including a pop version by Hugo Montenegro, a jazz version by Al Hirt and rock versions by The Ventures and Billy Strange (most of which are now out on CD). Szathmary's theme was also reprised in Peter Rodgers Melnick's score for the 1989 TV-movie Get Smart Again! – although in that case, unlike the current feature film, Szathmary received proper credit. After Get Smart ended in 1970, Szathmary decided to retire. In the mid-1970s, Irving and fourth wife Monica moved to the Mediterranean island of Malta. They traveled to London to celebrate Irving's 76th birthday with friends; he died there on October 29, 1983, the day before his birthday, and was buried there. Today, Stern believes that Szathmary never received enough credit for his musical contributions to Get Smart: "It was very significant, an identification for the show," he says. "The musical tone set the physical tone; they were to me, inseparable. I wanted something that foretold – from the first beat – what you were about to see. It required humor, mystery, suspense and action... but from a different perspective." Editor's note: A lengthier version of this article, accompanied by rare photographs of Irving Szathmary, is featured in Vol. 23, No. 3 of The Cue Sheet, the quarterly journal of The Film Music Society.